False Memory from Finland's Anssi Hohti a.k.a. 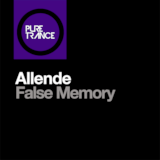 Allende is deceptive; the first third consists of a laid-back trance groove (which sounds very Finnish actually, Allende being placed firmly in the Orkidea / Lowland camp when it comes to sophisticated, stylish production) but when we hit the (very club-friendly) breakdown, all manner of maelstrom is unleashed; the mother of all stadium-sized riffs erupts and lifts the track to a completely new level. It is such a huge moment when the track finally drops - big smiles all around and a very happy dance-floor.